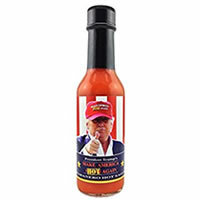 President Trump Hot Sauce is a delicious sauce that brings a touch of spice and flavor to anything you desire. It has a medium spice level, so nothing too hot or overwhelming. Just like Trump, this sauce has a bite. The sauce is bright reddish orange with chunks of black and red speckles. I was surprised by the deliciousness of the sauce; it was pretty GREAT! You can definitely taste the Garlic, Vinegar, and Cayenne Pepper. I have to admit the mix of ingredients creates a flavor leaving you craving more. The heat comes from the Cayenne Pepper and maybe the lack of P.C. 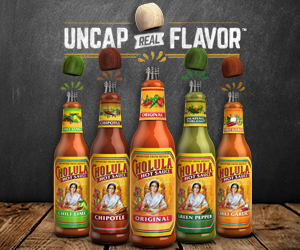 All in all, it’s a delicious sauce with lots of flavor that leaves your mouth wanting more. Perhaps I would suggest this sauce to make your dinner great again. This sauce is bright reddish orange with a thin runny texture. It has black and red speckles throughout the sauce. President Trump Hot Sauce has a peppery scent with a hint of vinegar. I actually like the taste more than the smell. President Trump Hot Sauce has a slight spice to it, so I would describe the heat level as medium. Without any P.C. and lots of Cayenne Pepper, there is definitely a bite. It’s nothing too hot though. I could taste the Cayenne Pepper, Garlic, and Vinegar. President Trump Hot Sauce has all natural ingredients- Water, Cayenne Peppers, Salt, Garlic, and Natural Spices. This mix of ingredients really rounds out the taste. The Cayenne Peppers bring the spice while the salt and garlic balance the flavor. When I added President Trump Hot Sauce to cooked chicken and allowed it to cook a bit, the sauce developed a well-rounded depth of flavor. Surprisingly, after cooking the sauce on the chicken, the spice actually became stronger. I was able to really taste the Cayenne Pepper. The 5 oz bottle costs $6.00. That’s a reasonable price considering how delicious it is.